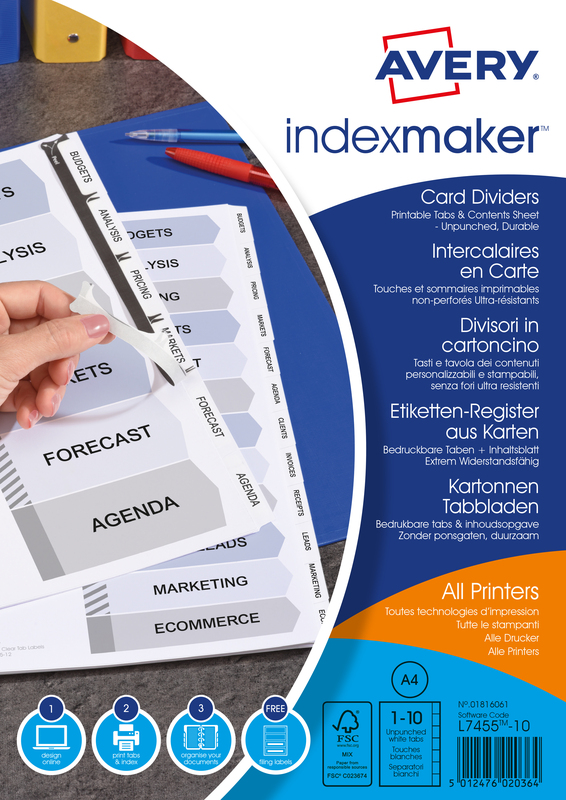 • Create professional looking dividers with your PC and laser/inkjet printers. • Customise the clear divider tabs with your own printed titles, ideal for impressive looking presentations, proposals and dividers. • Fast, simple and easy to use with pre-set layouts for tab labels and contents sheets in Microsoft® Word and other popular software packages. • Each pack comes complete with dividers, clear tab labels and printable contents sheet. With this Avery A4 index Maker divider, negotiating through documents has never been simpler. The 10-part divider allows you to organise your documents into different sections with ease and improves not only specific data retrieval but the overall aesthetic of your documents. Corporate logos can be added to your contents page, ensuring that whether you are presenting to a client or a boss, they will be impressed with the quality of your work and organisational skills.